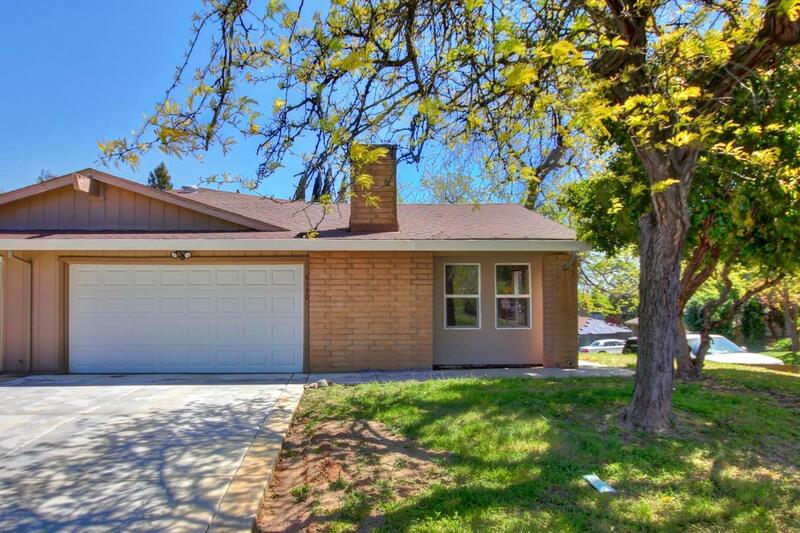 Completely remodeled 3 bedroom/2 bath halfplex in Orangevale. This well designed floorplan offers large living room with cozy fireplace complete with travertine backdrop, engineered hardwood flooring, and modern LED lighting. Updated kitchen boasts stainless steel appliances, granite counters, gorgeous cabinets, pendant lighting, and pantry closet. Ample dining space for full table in formal area as well as breakfast bar, with oversized tile flooring. Inside laundry cabinet for full sized units. Master suite offers beautiful bath with custom tile surround, granite top vanity, walk in closet, ceiling fan and back patio access. Hall bath is also updated with custom tile surround, granite top vanity, and diagonal oversized floor tiles. Exterior has NEW stucco. Building is all electric and will have new hot water heater by close of escrow. Convenient location near award winning San Juan Unified Schools.